A few days ago, at the Africa Pension Summit organised by the National Pension Commission (PenCom) in Abuja, Governor Nasir El-Rufai of Kaduna made some interesting comments about interest rates in the Nigerian economy. To say those comments are interesting would be an understatement. You should not doubt that Governor El-Rufai has the influence to make this happen, one way or the other, under the current regime. It will also be ‘popular’ and will allow the government show that it is ‘doing something’. But the questions to ask are 1. Can the government really force down interest rates? And 2. If the goal is to bring down interest rates, is this the best way (political fiat) to do it? I think there is another way to do it. One that uses the proper channels of monetary policy and is perhaps more sustainable than a political solution which the banks will soon game. That solution is Quantitative Easing (QE). Calm down, calm down. Please don't get too excited at the thought of ‘printing money’. The key thing is that there are very recent examples of where QE has been successfully used to lower interest rates. For this post, we will look at the UK and the USA. In December 2008, as evidence of a dramatic slowdown in the U.S. economy mounted, the Federal Reserve reduced its target for the federal funds rate — the interest rate that depository institutions charge each other for borrowing funds overnight — to nearly zero, in order to provide stimulus to household and business spending and so support economic recovery. With the funds rate near its effective lower bound, leaving little scope for further reductions, the Federal Reserve made a series of large-scale asset purchases (LSAPs), between late 2008 and October 2014. In conducting LSAPs, the Fed purchased longer-term securities issued by the U.S. government and longer-term securities issued or guaranteed by government-sponsored agencies such as Fannie Mae or Freddie Mac. The Fed purchased the securities in the private market through a competitive process; the Fed does not purchase government securities directly from the U.S. Treasury. The Fed’s purchases reduced the available supply of securities in the market, leading to an increase in the prices of those securities and a reduction in their yields. Lower yields on mortgage-backed securities reduced mortgage rates as well. Moreover, private investors responded to lower yields on U.S. Treasury securities and agency-guaranteed mortgage-backed securities by seeking to acquire assets with higher yields — assets such as corporate bonds and other privately issued securities. Investors’ purchases raised the prices of those securities and reduced their yields. Thus, the overall effect of the Fed’s LSAPs was to put downward pressure on yields of a wide range of longer-term securities, support mortgage markets, and promote a stronger economic recovery. Why was QE needed in the UK? Quantitative easing was first used by the MPC in March 2009. The official interest rate (Bank rate) had been reduced to 0.5% and the MPC judged that it could not practically be reduced below that level. So in order to give a further stimulus to the economy, the MPC decided on a program of QE. Without that extra spending in the economy generated by QE, the MPC thought that inflation would be more likely in the medium term to undershoot the target. The Bank of England electronically creates new money and uses it to purchase gilts from private investors such as pension funds and insurance companies. These investors typically do not want to hold on to this money, because it yields a low return. So they tend to use it to purchase other assets, such as corporate bonds and shares. That lowers longer-term borrowing costs and encourages the issuance of new equities and bonds and that should stimulate spending. When demand is too weak, QE can help to keep inflation on track to meet the 2% target. QE does not, as is sometimes suggested, involve printing more banknotes. And QE is not about giving money to banks. Rather, the policy was designed to help businesses raise finance without needing to borrow from banks. And also to lower interest rates for all households and businesses. You can see that both explanations are almost identical. Let’s unpack them in simple English. The first response by the Fed and the BoE to the ‘credit crunch’ was to lower interest rates. But when you have lowered interest rates to nearly zero and the ‘credit is still crunching’, you need another weapon to use. Hence the Fed and BoE launched QE or LSAP if you prefer. The next step was then to buy government bonds from private investors. This is an important point — they did not buy government bonds directly from the government. They bought government bonds from private investors who had previously bought them from the government. Could they have bought bonds from the government directly? Certainly. This would then have given the government money to spend in the economy. But that sounds more like a political solution than a sustainable economic one. Remember that interest rates were already at rock bottom at this time. So when the Fed or BoE started buying these government bonds from private investors, those guys suddenly had a lot of cash in hand. They couldn't just put the cash in the bank as it would yield next to nothing in interest so the only other option was for them to take the cash and go invest it in something with better returns than cash. Bear in mind that in an economy, the safest person you can lend money to is the government. This is even more so in an economy where the government owns its own currency e.g the USA (dollar), the UK (Pound) or even Nigeria (Naira). The Central Bank of Spain cannot do this as it does not control its own currency (the Euro). This means that in such economies, the laziest way you can invest is to simply buy government bonds and sit on them. You can then follow the logic a step further — if government is the safest person to lend money to in an economy, almost certainly, the government will pay the lowest rate of interest to borrow money. After all, the interest rate simply reflects the risk of lending to someone. Therefore, the rate at which the government can borrow is often referred to as the risk free rate. You can now have a clearer view of what the Fed and BoE were trying to do with QE. To put it crudely; they were trying to chase people into the proper economy away from safe assets. To put it in jargon — The Fed and BoE were encouraging investors to move out along the risk curve by buying their safe assets and giving them cash to spend. But what would be the effect of the Fed and BoE pumping in money to buy these safe assets from investors? We can understand from simple economics that if there is now more money chasing these assets, their prices will rise. You can see the Fed acknowledging this in the statement above — they mopped up the government bonds from the market which created some level of scarcity and increased the prices of the assets. So far, so conventional. The next important thing to know is that bond prices and interest rates have an inverse relationship. This is as old as time and you don't really have to understand why. The key thing to note is that when interest rates go up, prices of bonds go down. When interest rates go down, prices of bonds go up. (if you want an explanation of this, you can read this). Now it all makes sense. The Fed said QE was designed to ‘put downward pressure on yields of a wide range of longer-term securities’ while the BoE said it ‘lowers longer-term borrowing costs’. By entering into the markets with QE to buy government bonds from investors, the Fed and BoE were able to push down interest rates. Recall that they had already lowered official interest rates to near zero and the economy still needed stimulus. Pumping all that money into the economy can of course cause inflation. At the time, the risk in the UK and USA was actually deflation so a bit of inflation was welcome. But if inflation started to go out of control, The Fed and BoE would simply sell those assets they bought and take some money out of the system. That is, an important feature of QE is that it can be reversed. If you simply print money for government to spend, it cannot be reversed in the way once the money has escaped into the economy. This is what happened to Zimbabwe and it ended up with 500 billion percent inflation. So how do we bring this all home to Nigeria in a way that can help bring down interest rates? 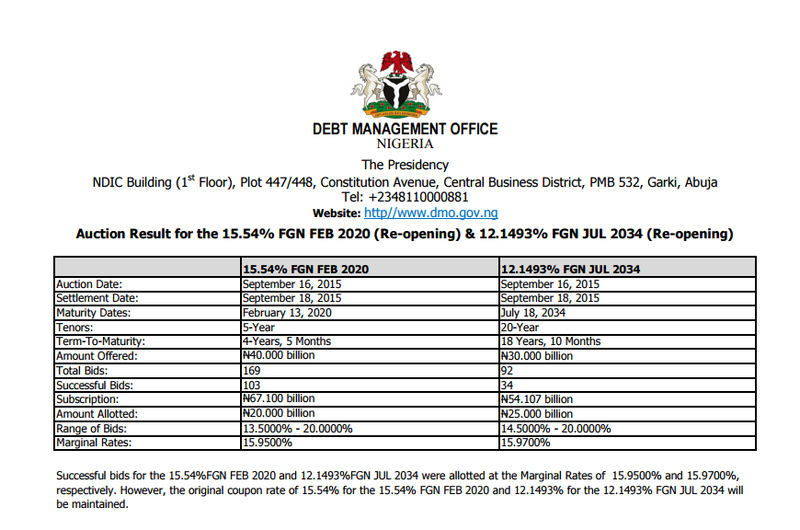 The first thing to ask is how much does the Nigerian government pay to borrow money ie, the interest rate on FGN bonds. Remember that Nigeria owns its own currency and as such the government can never run out of money to repay its Naira debts (in theory). This means that buying FGN bonds in Nigerian Naira is the risk free rate in Nigeria. It will be difficult for anyone else to borrow money at a cheaper rate than what the government pays. From the chart above we can see that the FGN is paying 15.54% to borrow for 5 years and 12.15% to borrow for 10 years roughly — all per annum. This is where the problem starts. The safest person to lend money to in the economy is paying 12–15% in interest rates. Who are you Mr. Small Business? It does not make any sense for a bank to lend significant sums of money to anyone in Nigeria at lower rates than what it can get by simply buying government bonds. So if you want to bring down interest rates in the Nigerian economy, you have to start from the government i.e the risk free rate. If the government pays lower interest rates to borrow, the reduction in rates will feed into the wider economy. And one way to make this happen is by moving banks away from the lazy business of lending money to the government at 15% and heading to the golf course. The same thing is happening with Pension Funds in Nigeria. Even though they are mostly constrained by law to only lend to the government, if interest rates on government borrowing comes down, perhaps it will speed up the loosening of the PenCom Act in ways that will allow them look for other investment opportunities in the Nigerian economy. To be clear — QE is a potentially explosive weapon in an economy if not handled properly. Ben Bernanke and Sir Mervyn King were famously the coolest central bankers you could come across and were able to resist political pressures to go wild with the thing. It needs a calm head at the Central Bank to pull off successfully. That person is definitely not Godwin Emefiele who believes you can make 100% returns on palm oil business in a matter of days. Governor El-Rufai is spot on in saying that an economy where it costs 25% to borrow money is not really going anywhere. But the answer to his question lies closer to home — the challenge is to get down the interest rate the government pays to borrow. At least as a first step. But more importantly, before we get to the nuclear option of a political solution to the problem, why not try out something a bit more conventional by moving Nigerian banks and pension funds away from this lazy business and getting them into the real economy? That way we solve an immediate problem while restructuring the economy at the same time. Surely it cant hurt (too much) to try? P.S There are several other risks with this of course. For example, if you lower cost of government borrowing wont the government then be encouraged to simply borrow more money just to pay salaries as opposed to restructuring the civil service? It’s a good question but one blog post cant possibly answer every question.